"I can carry more than sticks with my backpack!" Hands-free and close to your body: just two reasons to consider a backpack for your dog. Choose wisely, though. If the backpack is too small, your pup might be uncomfortable; too large, and he might take a tumble. Luckily, canine backpacks come in all varieties, shapes and sizes. Traditional backpacks situate your pup on your back as you stroll through the farmer’s market or hike a strenuous trail. Check the weight limits carefully when shopping for backpacks – you don’t want too much strain on your shoulders when toting your buddy up and down hills. Because traditional backpacks keep him out of sight, it’s important to choose one with plenty of breathable mesh or open sides, especially if you plan on using it during the warmer months. The Timbuk2 Muttmover backpack features a tethered clip to keep your dog secure and open side panels for breathability. Cross-body carriers are a good choice for short distances. 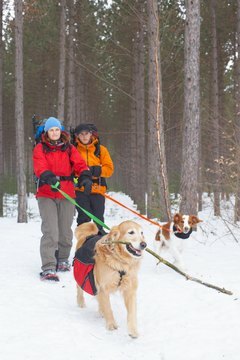 You wouldn’t want to hike with your canine companion in a cross-body bag, as his weight would put too much strain on your shoulder, torso and neck. Look for cross-body bags with padded straps and reinforced bottoms to provide both you and your buddy with plenty of support. Some backpacks, like the Pet Gear I-G02 Traveler Pet Carrier, transition from a traditional backpack to cross body or tote bag providing all your 3-in-1 canine toting needs. Front-loading backpacks are excellent options for injured dogs. They enable you to keep a watchful eye on your buddy while still allowing him to escape injury-induced house arrest. They’re also useful for train or bus travel, especially if he gets anxious in an enclosed kennel, and for smaller dogs who just can’t jog as long as their owners. Keep your pooch close and snug yet still part of the action in a legs-free front carrier like the Outward Hound Legs Out Pet Carrier. What About the Big Dogs? Backpacks aren’t just made for putting dogs into; many companies offer backpacks your larger dog can wear himself. This lets him carry his own water on long hiking trips and saves room in your own backpack. Some dog backpacks, like the Ruff Wear Palisades Dog Pack, feature built in hydration pockets that distribute your pup's water evenly over his body. Throw in a couple of collapsible water and food bowls, and he’s his very own kitchen in the middle of the wilderness. Just make sure to measure the widest part of his body to ensure a comfortable fit for all that hiking. Do Sardines Help a Dog's Fur Coat? What Causes Urethral Blockage in Male Cats & Is it Worse Than in Female Cats? Do Parrots Drink From a Bottle or a Dish? Do Dogs Like to Be Tickled? What Does It Mean When a Cat Loves You Too Much?